The impetus for this series was the #YourTurnChallenge on Seth Godin's blog. The challenge is to write one post every day for seven days, starting today. After some contemplation (and despite a full schedule), I decided to accept this challenge. 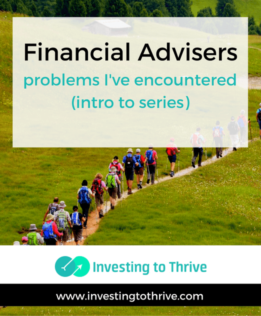 I thought it would be enlightening to readers and cathartic for me to write about my experiences with financial advisers. First, I want people to understand that some advisers deserve their reputations as not being good for their clients. In fact, I've done business with representatives of prominent organizations, which have lost or settled civil suits with allegedly wronged clients. So when good advisers wonder why people don't seek sound advice, I want to tell them that it's because there is so much bad out there. Even those who truly want to help may misrepresent their capabilities to clients. A reading that prompted me to explore this topic was a discussion in a private forum. Someone who I respect (and also a Certified Financial Planner-CFP) expressed his dislike of one of the new robo-advisory firms. My research uncovered this Forbes article, “Why Betterment, Wealthfront, and Other Online Investment Firms are Wrong about Financial Advisors,” which references a post that appeared on Betterment's website. From what I can discern, this person dislikes these firms because of this blog post (and perhaps other reasons). As a disclosure, I have a relationship with Betterment. First, I am an affiliate, which means that if you open an account with this firm by following a link on my site, then I may be paid a commission. In addition, I have written content for the company's blog for which I have been paid. Finally, I am a Betterment investor, having tested the firm's services as part of an investing competition. My $1,000 investment grew in value though its return was significantly dinged by the firm's $3 per month fee (which has since been eliminated). Going forward, I am going to invest with this firm only if I qualify for the 0.35% management fee, which requires having $10,000 invested with the firm or authorizing a $100 per month automatic investment. Update: I can now invest for 0.25% with no minimum or monthly requirement. My take on the financial adviser vs. Betterment battle is that both types of advisory services can be useful: 1) personalized and comprehensive direction on managing finances; and 2) investment portfolio management advice that is distinct from broader financial planning services. Rarely have I found these together at one low cost. I'll kick off this series with a story about financial advisers guaranteeing a return of 8%. My husband heard about this offer from coworkers who were planning an early retirement by converting a large position in company stock held in an ESOP (employee stock ownership plan) to a retirement plan involving substantially equal periodic payments (SEPP) allowed under IRS rules. Basically, you invest a lump sum of money inside of a specialized retirement plan and receive payments from the invested dollars in (early) retirement; similar to an IRA, the money grows tax-free but you pay ordinary income tax on the required withdrawals. The financial advisers told the early retirees that they would receive an 8% return, guaranteed. The retirees thought that they would receive a guaranteed investment return of 8%. That is, they believed that if they invested $1,000,000, they would receive $80,000 per year in retirement ($1,000,000 X 8% = $80,000). Even though I knew that getting 8% per year guaranteed was not something available to anyone, I thought perhaps a sharp money manager could generate those types of returns on large amounts of money. I called a friend who happened to hold a doctorate in financial education and worked for the local extension office (an office that was later closed due to funding cuts). She assured me that no one could guarantee that high of a return. What I eventually realized is that the payout rate for these retirement plans would be set at 8% but this rate was not an investment return. If the investments grew at say 10% each year, then not only could these early retirees get an annual payout of $80,000 but they could also continue to build their nest eggs. However, if the investments returned 4% each year (or worse, fell 15% for example), then, at 8% withdrawal rates, they'd soon run out of money. Now, you may think that these folks were naive or gullible. But the advisers were either leaving out pertinent information or failing to clarify what 8% guaranteed really meant. I have since read about financial professionals taking advantage of early retirees at other companies in a similar way. There seem to be three types of financial advisers: 1) wolves, who simply want to generate sales and feel no guilt about taking actions that detract rather than build the client's wealth; 2) advisers who inadvertently function as wolves by being unable to differentiate between appropriate and inappropriate advice for their customers and push products based on company sales initiatives; and 3) advisers who recognize and admit the limits of their knowledge and advice, and provide guidance on what they do know and make referrals on areas outside of their expertise. Based on my interaction with financial writing colleagues through face-to-face and online forum discussions, CFPs tend to fall in category #3. But they may not realize how many of those who are labeled (but not necessarily credentialed or certified) financial professionals fall within #1 and #2 categories. So, I'll share my stories so you can more readily recognize expert guidance as opposed to sales spiels.